The deal means FG can do another print run of its hugely popular red gatepost signs and offer them for free to all readers. Farmers Guardian’s high profile Take the Lead livestock worrying prevention campaign has secured a new sponsor in the form of outdoor footwear brand The Original Muck Boot Company. 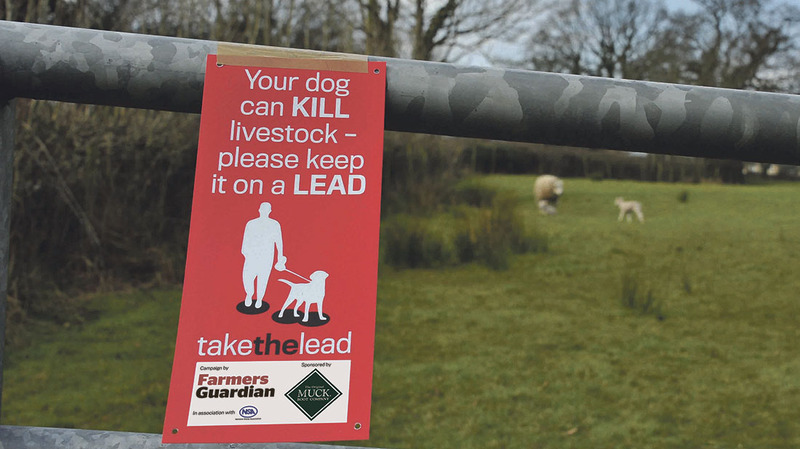 The company has agreed to sponsor FG’s popular red signs which warn dog walkers to keep their dogs on a lead around livestock. Peter Mellish, managing director of Belstane UK and Ireland, distributor for The Original Muck Boot Company, said: "The Original Muck Boot Company is committed to supporting every day, outdoor people who depend on their livestock and land. Therefore, the Take the Lead campaign is an important extension of our work with farmers and dog walkers alike. The impact of irresponsible dog ownership was brought to the fore once again this week when Ayrshire farmer Alister Orr described the ‘utter carnage’ left by three dogs which attacked more than 30 sheep and killed at least nine. FG remains committed to driving down the number of incidents and has been working with police to educate officers about the seriousness of the crime and its impact on farmers and the countryside. The FG team is currently lobbying MPs to see the issue debated in Parliament and continues to call for tougher penalties for owners whose dogs harm livestock. More than 50,000 Take the Lead signs have been sent out since the campaign began in 2014.